BOSTON, MA -- The Eastern Hockey League (EHL) and the Eastern Hockey League Premier (EHLP) are pleased to announce that the New England Wolves have won the 2017-18 Humanitarian Award. New this season, the Humanitarian Award recognizes the organization which provides outstanding contributions to their community. With over 1000 hours of community service and volunteer work, it's no surprise that the coaches have selected the Wolves as this season's Humanitarians of the Year. "This is a new award that we brought to the table, because the experience of playing junior hockey is about more than what takes place inside the glass," said Mark Kumpel, the EHL's Director of Hockey Operations. "Our organizations are helping these players grow as young men, and much of this growth takes place away from the rink. I would like to personally congratulate Andrew Trimble, Tim Kunes, and the rest of the Wolves organization, for the foundation that they've begun to establish in Laconia. 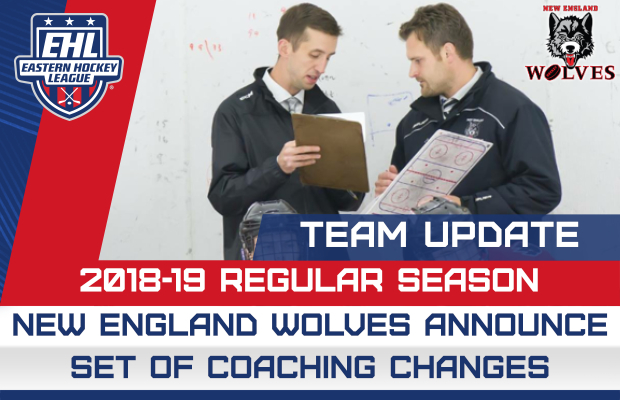 Outside of the hockey, they've put in the work to help build the New England Wolves as a highly-respected brand in the Lakes Region. Looking at their body of work, I have no doubts with the Wolves winning the Humanitarian Award for the 2017-18 season." As Kumpel mentioned, the Wolves are led by Andrew Trimble and Tim Kunes. Trimble serves as the General Manager for the entire organization, while Kunes just finished his first year of coaching at the junior hockey level. Working together, they kept their entire organization very active in the community this past season. NH Humane Society Donation Night - Collected pet food and supplies, kitty litter, and fundraising for the organization. Maria Mayne Benefit - Raised money for local women stricken by Leukemia. JBT Benefit Game - Raise over $23,000 for the Cure Stars Now Foundation. It was a truly special season for the Wolves in the Lakes Region community. With a new fundraiser and/or event almost every week, the players stayed active during their free time away from the hockey rink. While the main goal of junior hockey is set on helping players advance to the next step of their journeys, the New England Wolves also do a phenomenal job teaching their players how to become better individuals. The Eastern Hockey League (EHL) and the Eastern Hockey League Premier (EHLP) strive to build up every player to best of their abilities both on and off the ice. It's not just about how many points you finish the season with, as our focus also centers in on making our players better people. 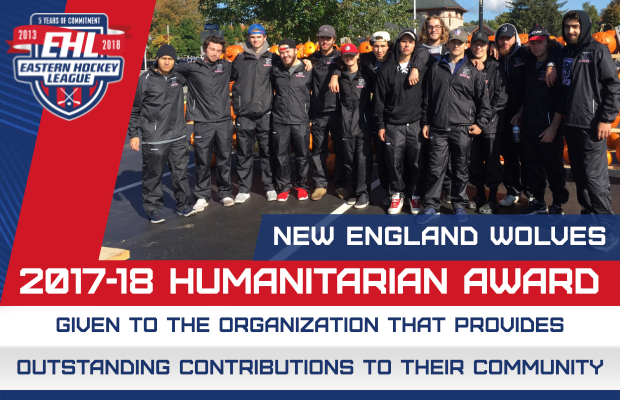 Congratulations to the New England Wolves on being named the 2017-18 Humanitarians of the Year.